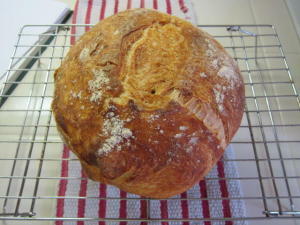 If you can recall, there is a limited amount of bread and pastry making on Top Chef. It is not that we do not enjoy eating, using, and cooking them of course. Quite honestly, there isn’t really time to bake bread. But, of course, I serve it in my restaurant. I LOVE bread. 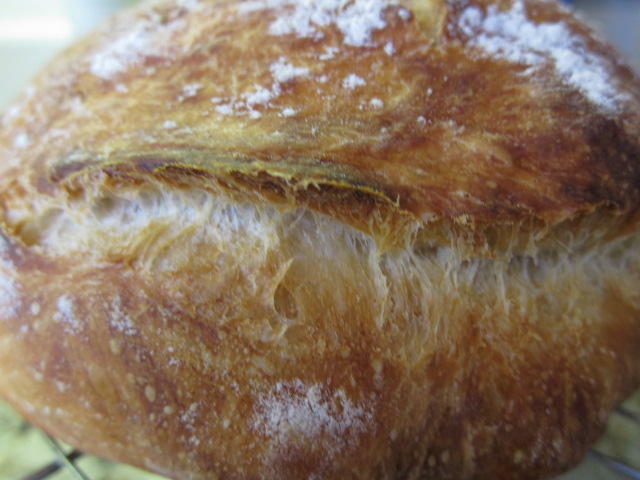 The biggest problem I see with baking bread at home is the kneading, the proofing, the waiting. 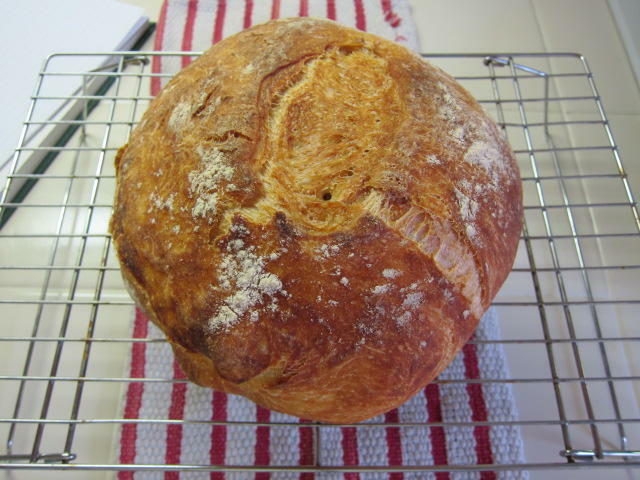 I like the idea of wanting fresh baked bread and actually getting to eat it in the next couple of hours. So, if you are wondering if this is a recipe that will allow you to make bread and it in an hour or two, you are mistaken. Bread is about patience. If you want quick bread, eat biscuits and cornbread. If you want bread that will make your stomach do happy flips, make this recipe. I stumbled across a recipe that was published in the New York Times in 2006 for a “No-Knead Bread”. What? Can this be done? I instantly thought, “wow, this chef has figured out a miracle”. It seemed like a great idea. But, I was skeptical. THEN, I stumbled recently on an old Cook’s Illustrated article that wondered the same thing I did. Is it possible to make no-knead bread. It appeared from the article they wrote, no. So, as they do, because they are the test kitchen, they altered the recipe. They found there is no such thing as “no-knead bread”. I agree. The glutens in the risen flour has to be activated. So, what were the findings? Minimal kneading. Did it work? Let’s find out. 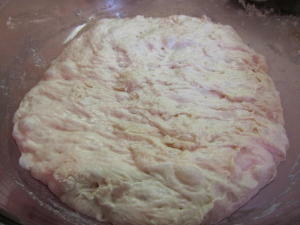 The first thing you must understand about bread making is that you must have fresh yeast. You can not pull that forgotten, hidden packet of what you think is yeast in the back of your pantry. Go buy new yeast. Do a yeast test to make sure your yeast is fresh if you are unsure. 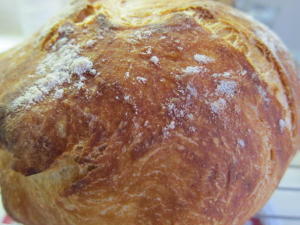 Here is a recipe to make bread at home, crisp, delicious and semi-easy. Take a crack at it. I found it to be the tastiest bread I have ever made. 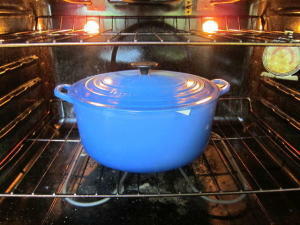 First, you need an enameled cast iron Dutch oven with a lid. Here is what I found to work best. Whisk flour, yeast, and salt in a large bowl. 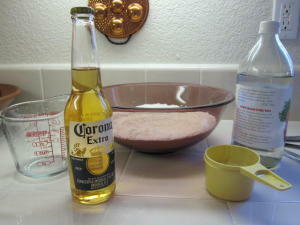 Add water, beer and vinegar to the dry ingredients. Using a rubber spatula, mix the ingredients together making sure that the bottom of the bowl is mixed also. Do not leave any dry flour in the bottom of the bowl. 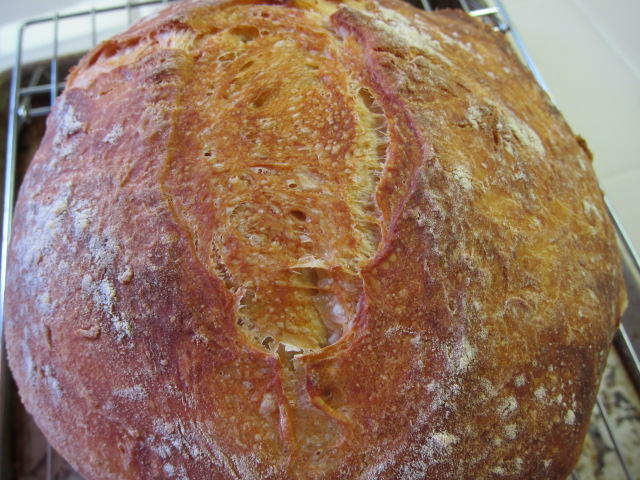 If you do not get all of the flour wet, it will remain dry and will be tough in the loaf. The mixture will appear dry. Cover the bowl with plastic wrap and set in a room temperature place. Rest it for 18 hours. Yes, 18 hours. 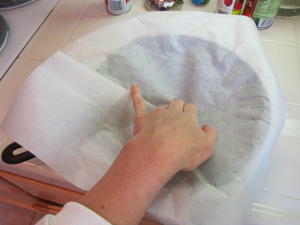 Lay a square 18” sheet of parchment paper inside a 10” cast iron skillet. Spray with non-stick spray. 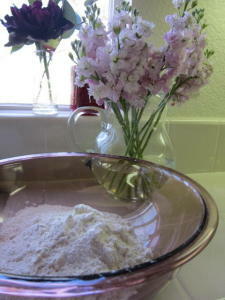 Transfer dough to a lightly floured surface and knead 16 times. Shape the dough into a ball. Transfer the dough, seam-side down to the parchment-lined skillet and spray the surface of the dough and cover with plastic wrap. 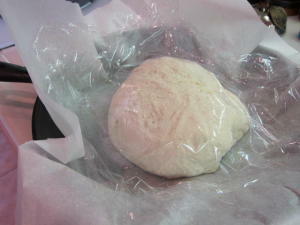 Let the dough rise until it is doubled in size, 2 hours. 30 minutes before baking, adjust the rack to the middle position and place a 6-8 quart Dutch oven and heat the oven to 475 degrees. Lightly flour the top of the dough and cut a ½” deep cut, 6” long into the top of the dough with a sharp knife. Remove the pot from the oven and remove the lid. Lift the parchment paper with the dough from the skillet into the Dutch oven. 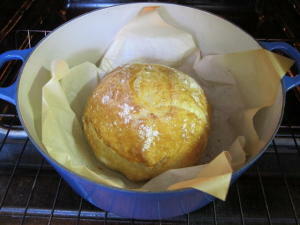 Reduce the oven temp to 425 and bake the bread covered for 30 minutes. Remove the lid and cook the bread until it is a deep brown or an instant read thermometer reads 210, 15 minutes longer. 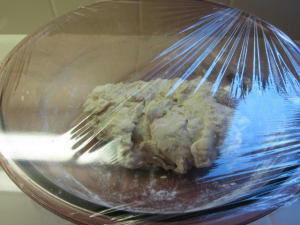 Remove the bread from the pot; transfer to a wire rack and cool 30 minutes. Eat! Bread lasts 2 days max.